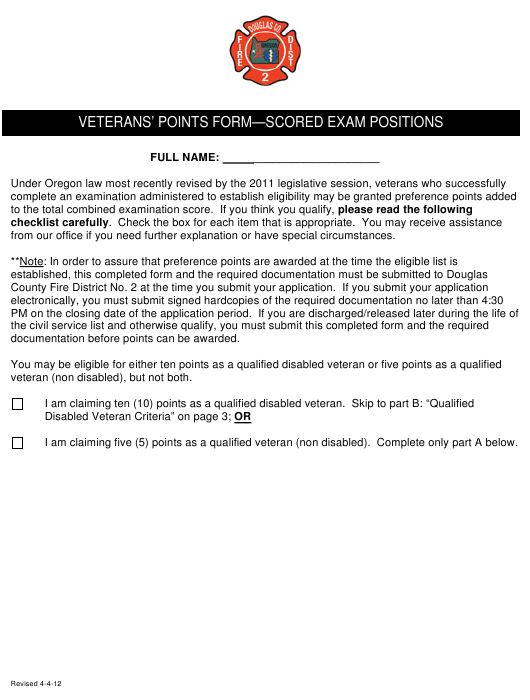 This "Veterans' Points Form - Scored Exam Positions" is a part of the paperwork released by the Oregon Department of Veterans Affairs specifically for Oregon residents. The latest fillable version of the document was released on April 4, 2012 and can be downloaded through the link below or found through the department's forms library. from our office if you need further explanation or have special circumstances. documentation before points can be awarded. veteran (non disabled), but not both. I am claiming five (5) points as a qualified veteran (non disabled). Complete only part A below. or DD-215 that includes your discharge/release status (e.g., honorable discharge). organized reserve or National Guard unit is not considered active duty. ***You must provide proof of eligibility by submitting a copy of your DD-214 or DD-215. disqualification or dismissal, regardless of when discovered. from the Department of Veteran’s Administration. or dismissal, regardless of when discovered.